Heading out of town for Christmas or Hanukkah this weekend? Whether you're planning a trip or preparing to welcome guests, we have the weather and travel information you need to know -- including the best times to hit the road and alternates if you hit traffic. What Will the Weather Be Like for Your Trip? Weather in our region will be good for most of the next few busy travel days. But Saturday may be a little miserable for last-minute shoppers and travelers. Rain will move into the area for most of the day, tapering off around sunset. Christmas Day will be dry, but the amount of sunshine we will see is still a bit of an open question. Afternoon highs will reach the upper 40s. Cloudy, milder weather is expected for Monday and Tuesday, with highs well into the 50s. For more information on upcoming weather, check out StormTeam 4's live interactive radar. According to AAA, more than 103 million Americans are expected to travel between Dec. 23 and Jan. 2. How will the majority of these travelers be getting around? By car. AAA estimates 93.6 million people will take a holiday road trip this year, an increase of 1.5 percent from last year. News4's Melissa Mollet says the best time to hit the road is during off-peak hours. "That means leaving early or very late, when fewer people are on the roads," Mollet said. In Maryland, you can get real-time updates on major incidents on the Maryland Transportation Authority's Twitter account. But if I-270 is packed, try giving US-15 a shot. Drivers stuck in traffic on I-95, should consider the Baltimore-Washington Parkway and US-1 as good altervatives. In Virginia, all major work zones and lane closures will be lifted from noon Friday until noon Tuesday. 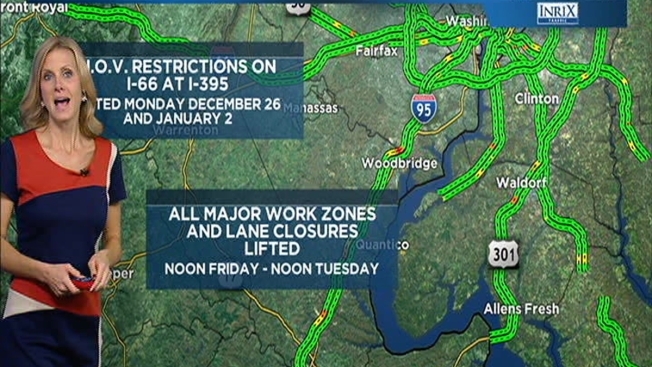 HOV restrictions on I-66 and I-395 will also be lifted Dec. 26 and Jan. 2. On I-95, the express lanes will close northbound at 10 a.m. Friday and open southbound at noon. The express lanes will be open in the southbound direction all day Saturday. On Sunday, the express lanes will stop going southbound at midnight and begin going northbound at 2 a.m. If the bottom of the Capitol Beltway or I-95 are backed up, consider taking US-301 instead. 1. Still don't have an E-ZPass? Get one. You'll save a signicant amount of time. Although it's too late to order one online if you want it before traveling for Thanksgiving, the transponders are available at a few retail locations. Visit EZPassMD.com or EZPassVA.com to see where you can get one in person. 2. Do have an E-ZPass? Make sure your info's up to date. Go to your state's E-Zpass site to verify that your credit card, license plate number and contact information are all current. 3. Don't have roadside assistance? Get it. Make a quick call to sign up for it through your car insurance company, or go online to register with AAA. You'll have help if the unexpected happens, both to keep you safe and to save yourself a lot of time and frustration. 4. Make sure your car is ready for the trip. Consumer Reports has a quick checklist you can run through, including making sure all your lights are working, your washer fluid's filled and your tire pressure is good. See the full list here. 5. Don't text and drive... or look at directions and drive... or flip through your playlist and drive. In Maryland, it's illegal to text or otherwise handheld cellphones while driving. Texting while driving is illegal in Virginia. Designate your front-seat passenger to be in change of your phone, the playlist and the directions. 6. Take a safety break. You might be tempted to make as few stops as possible, but don't drive for so long that you become a danger to yourself or others. A break at a rest stop will refresh you or let you exchange driving duties with a travel buddy. 7. But plan ahead to avoid unnecessary stops. If you have small kids, you're probably used to packing water and snacks. But even if your car's adults-only this Thanksgiving, it's always a good idea to bring along the basics. You'll also save money and probably end up with healthier options than what you'd get at a rest stop. Sara Moniuszko contributed to this report.